left: Eurasian Scale Armour, ca. 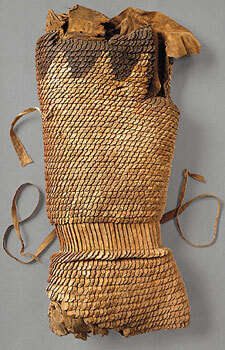 6th century B.C. Left: a drawing, centre, the actual glove. 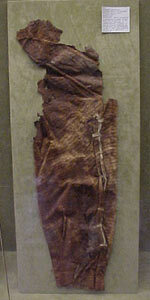 Right: prehistoric goat's leather pants. 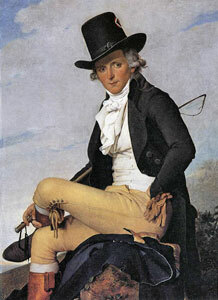 Right: French man in leather breeches in 1795. 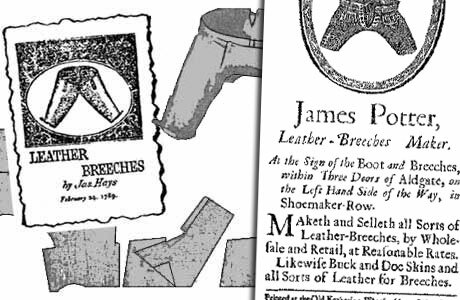 Advertisements for leather breeches in 1789. 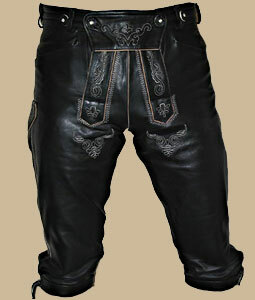 James Potter in London exported leather breeches to Virginia. the center boy wears a leather vest and leather cuffs. 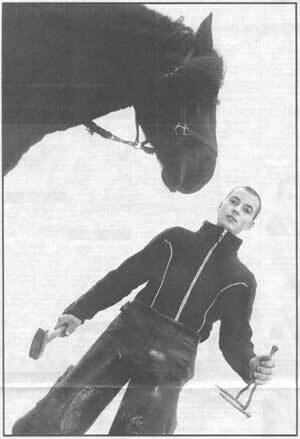 Even modern blacksmiths wear leather for protective reasons. already wearing leather pants and high boots. 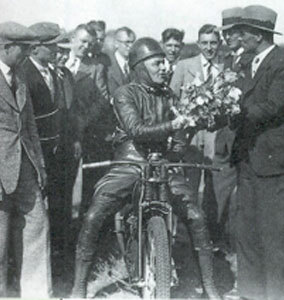 Left: Race winner in the Netherlands late 1920's. 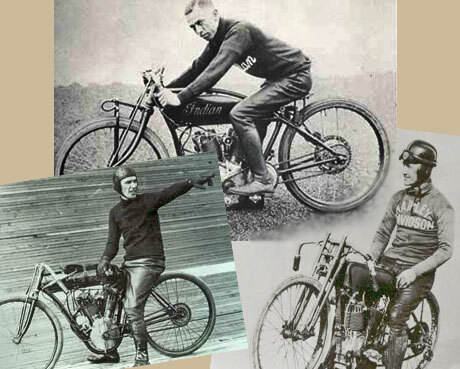 Right: a biker in the early 1950's. 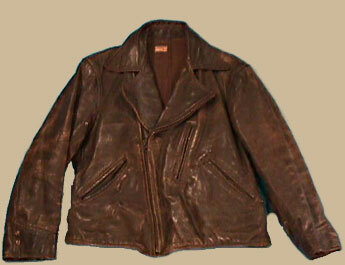 Left: brown leather jacket for a motorcyclist. Right: original French brown leather aviator uniform 1939. British and American uniform leather jackets in 1942. 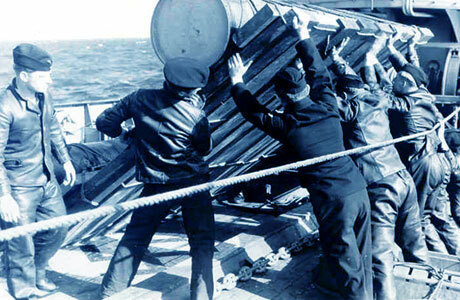 German U-boot crew wore gray full leather battle-dress. Advertisement for "Sportswear" in leather, late 1940's. "Mr. He-man, here's your coat!" Left: traditional black motorcycle jacket 1940's. Right: gay man posing in leather circa 1956. 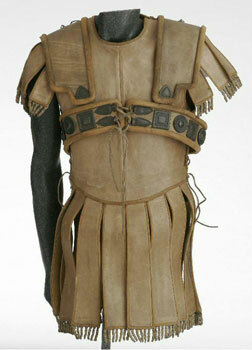 Black leather replaced the earlier brown leather fairly quickly after the war. 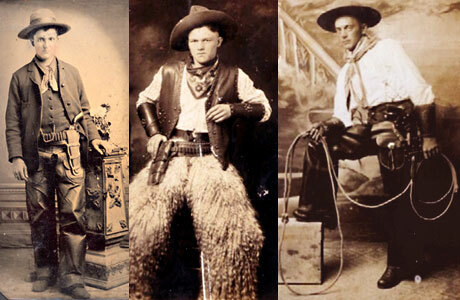 Above left: a picture of a motorcycle jacket from the 1940's - no wonder people wanted to wear this! 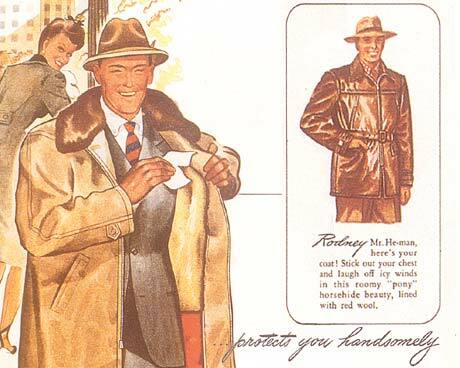 Even after sixty years this jacket looks very good and there is still nothing about the design that isn't right. 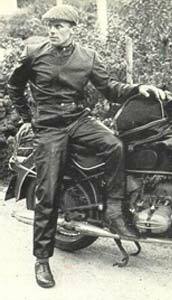 Above right: in this late 1950's picture the leather outfit is much tighter than the previous leather motorcycle suits, and it is black. Just looking at the way this man poses sitting on his bike rather than standing behind it, showing-off his entire body in leather, we suspected this to be a gay man with a leather fetish. After this picture was on our website for some years, we received an e-mail from someone who knew the man in the picture. Our assumption was confirmed! 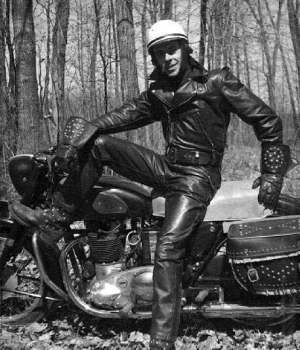 He was a biker from Quebec in Canada who had friends in the US and was indeed a leather fetishist. The picture was taken in 1956 or 1957.